This book is full of incredible insight into the life of someone dealing with body image issues. What inspired you to explore this subject? Body image is something I’ve struggled with throughout my life. I was a slim child, but then I got chubby as a prepubescent. I lost weight, then got fat as a teenager and then lost weight again in my early twenties. 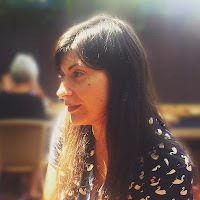 Throughout my twenties it was something I wanted to explore in my writing and I was always taking notes to that end, even as I wrote fiction and poetry on other subjects. When I was twenty-two, I wrote a poem called “Zoology” about not being able to find a plain black cardigan in a plus size store, but underneath, it was really about how marginalizing the experience of being fat was. It felt very good to write, but it was more of a rant than a poem, so it was ultimately not very satisfying— there was so much more I wanted to say. A few years later, after I’d lost weight and was working as a journalist, I wrote a feature article about my and my mother’s experiences with dieting trends in the 80s and 90s, but this didn’t feel like enough either. I didn’t want to explore the subject of weight on a cultural level or even on a strictly autobiographical level—I wanted to do it on a far more creative, intimate level. I was much more interested in this level of experience—how body image can affect your relationships to people, clothing, the way you are in the world. For that I needed the freedom to imagine, to draw out social dynamics and fully explore moments of rage, vulnerability and desire I had experienced both as a fat person and as a thin one. I needed characters that were separate from me and had their own stories—I craved the freedom of fiction. What was the genesis of 13 Ways? And can you describe your writing process? Most of the stories were inspired by a point of tension that I had observed, experienced or imagined— being in a fitting room with a dress that doesn’t fit, for example. I would take that point of tension and I would sit with it, trying to describe it in as much intimate, immediate and honest detail as possible. I would scrutinize it, draw it out, let myself imagine around it. By exploring a moment of tension like this, it would acquire more layers and consequence, and a story would often emerge. Once I had the contours of story, I could push that tension further still—in some cases, to its limits. 13 Ways of Looking at a Fat Girl is a provocative title. How did you choose it? The title was inspired by the Wallace Stevens poem, “13 Ways of Looking at a Black Bird,” though really only superficially. What I liked was the idea of using different ways of seeing as a way into the life of one character. In my experience, perception is a huge part of body image. I thought I looked fat before I was fat and, in some ways, that made me get fat. I also continued to see myself as someone who was fat after I got thin. So the idea of looking, for me, is really the most transformative, damaging and powerful driving force in the book. Being fat is also both a highly visible and invisible experience—visible because of the extra flesh and invisible because of the ways that flesh can eclipse you as a person, both in terms of how people see you and how you see yourself—so the title felt connected to that paradox of being both seen and unseen in various ways. It let me organize the overall story around the many ways in which Lizzie might be seen or imagine she is seen by various people in her life: sales women, friends, parents, romantic partners, flings, as well as how she might see herself in these relationships—ways of seeing that she resented, ways of seeing that were simplifications, or generalizations. Take “Your Biggest Fan,” for example. I would take each way of seeing—how Lizzie is seen by the other character, and how she sees him—and then, in the course of the story, try to unsettle and complicate it. The novel is told in a series of short stories, or vignettes. What made you choose this structure? So much of Lizzie’s story is bound up in how she views herself and the various ways she imagines others see her. So I wanted to approach telling her story as a series of glimpses--how she changes in relation to that shifting gaze, real or imagined—and I wanted the structure of the book to reflect that. Each way of looking seemed to be its own story that was connected to but also separate from the whole—another piece of a mirror (however warped) into which Lizzie is looking. The fairy tale promise of dieting and exercise is that your life will change for the better if you lose weight. But contrary to what we’re told by every women’s magazine and on shows like The Biggest Loser, Lizzie seems as unhappy in her new body as she was before—or maybe more so. Why doesn’t her transformation result in a happy ending? Transformation is a tricky thing. The idea that when we transform our bodies, we start off in one place and end up in another, is part of a notion about weight loss that this book is definitely trying to explore and challenge. My own experience of transformation was messy and complicated. Even after I got thin, I still felt like my weight was highly visible to anyone who bothered to look. In the way I behaved with others. In the way I ordered salad. Not in the fact that I ordered salad, but in the way I did—like it was penance, not a choice. In the way I wore my clothes—I wore them like they had been hard won, and they were. I felt too, that underneath those clothes, the visible evidence of having been fat was there. This is the case for Lizzie, too. She still has to reckon with her flesh, even its ghost, and so does everyone else around her. Her body, changed or unchanged, is still bound up in how she sees herself. That doesn’t necessarily go when the weight does. In Lizzie’s case, she’s still cognizant of her fat and so it’s still informing the way she is in the world, her relationships—and not necessarily for the better. In fact, in some ways it’s more complicated, because the weight is no longer visible, and so it’s harder for others to understand her. It seems that our society has made fat-shaming the last acceptable form of prejudice, with the underlying belief that being fat is a “choice”—and not the right one. Did you think about this at all while you were writing? It still seems culturally okay to make fun of fat people. When I was fat, I avoided going into elevators with people because I was afraid they would make fun of me after I left. In the book, I wanted to focus on depicting Lizzie and my other characters as honestly and with as much care as I could. I wanted to humanize and complicate portraits of people that are often seen as objects of ridicule. And, of course, it’s very telling that after Lizzie loses weight, she is at times guilty of seeing fat people this way herself. Lizzie forges a connection to her best friend as well as her future husband through music—specifically Goth industrial, a genre that we can safely say doesn’t get much air time in literature. Why did you connect Lizzie with this music, and what is its appeal for her? There’s a lot of music in the book—it’s definitely important to Lizzie throughout her life as a form of self-expression and self-discovery, and as a way to connect with other people. Certainly music provided that for me. Goth is seen as marginal and underground, and Lizzie, in seeing herself the way she does, identifies with that to some extent. But ultimately I think Goth is more of a phase she goes through in part because of her friendship with Mel—this music is an important part of their bond as teens, but their relationship to it and to each other shifts over the years. Lizzie’s relationships with other women are often quite barbed, especially when it comes to things like eating, exercise, and shopping—all of which come back, of course, to the body. What does 13 Ways have to say about female friendship? Female friendship is a subject that has always interested me as a writer. I love paying close attention to what goes on subtextually between women—things that we are not fully conscious of, that pass between us quickly. It goes without saying, perhaps, that body image can complicate these relationships and even come between women. After I lost weight, I definitely noticed a shift in the dynamics of some of my friendships. This is not to say that those friendships are any less valuable—I love and cherish all my female friends more than I can say. But I do think that female friendships can be idealized (or oversimplified in the other direction—as a caricature of petty, “mean girl” competition) and I wanted to explore what might else be going on under the surface. Writing this book gave me a chance to amplify and explore tensions and dynamics that fascinated me in my own experiences and in my observations of female relationships. For Lizzie, of course, all of her friendships and encounters with women are complicated by her own issues. But she’s definitely not alone in the creation of that weirdness. Clothing plays a meaningful role in this book, and Lizzie endures some very fraught situations in fitting rooms. Why did you feel this situation was important to represent in the book? Fitting rooms can be places of existential dread for people of any size. When you’re locked in an enclosed place with nothing but an item of clothing and a mirror, you have to reckon with yourself in a way that you don’t elsewhere. It can be a de-familiarizing, humiliating, excruciating experience. I guess because there’s also a yearning there, a desire for transformation, possibility, that fitting rooms offer too. When I was fat, I was angry and humiliated that I couldn’t find a decent dress and still I hoped. When I was thin, I was angry and humiliated that I still struggled to find things that fit me and yet I still hoped. I yearned to fit in. It’s that cocktail of hope and necessity that can make the fitting room experience so excruciating and revelatory, whether you’re in there with just an item to clothe your body, or something that symbolizes your dream self. Lizzie revisits the fitting room because, as much as she rages against it, she is very much a victim of that hope. What do you hope readers will take away from 13 Ways? Above all, a feeling of connection to the stories and the people in them. Fiction and especially short stories have always been extremely important to me. The books I love, I take to as one would take to a new friend. They have something very personal and urgent to tell me. They give voice to thoughts and feelings and desires and fears that I didn’t know I had. My favorite stories have always been the ones that feel very intimate, like the writer really gave something vital in themselves to the telling of the story. A little of the soul. I wrote these stories and these characters with as much honesty as I could in the hopes of making this book that kind of offering to the reader. I also wrote it, ultimately, to create a story that I would want to read. I can only hope readers will feel the same. Are there any books or authors that influenced your writing? What are you reading right now? American Psycho by Bret Easton Ellis really made an impression on me, though I can’t say that I was consciously aware of it as an influence when I was working on the book. I think it’s a brilliant, very disturbing and complicated portrait of a monster, who is at the same time a product of his culture and his age. Certainly Lizzie is no Patrick Bateman, but I do think I was interested in exploring a kind of monstrousness, a psychosis that our body image-obsessed culture can bring out in us. Another favorite is The Remains of The Day by Kazuo Ishiguro. Not only is it a wonderful story with an incredibly rich and nuanced first person voice, but I love the way Ishiguro can create a narrator who is so blind to certain truths inside himself, truths that are available to the reader to recognize, but that the narrator cannot access due to his own psychological and emotional blind spots. Mary Gaitskill’s complex characterizations and her interest in tension have always been endless sources of inspiration. I’m also huge fan of humor in fiction, especially with a dark or melancholy edge, so I love writers like Lorrie Moore, Dorothy Parker and Stacey Richter. Right now, I’m writing a novel and preparing to teach creative writing to undergraduates so I’m not reading anything too consistently, despite the tower of books on my bedside table. Though I did just order Where Did You Sleep Last Night by Lynn Crosbie, a great Canadian writer and poet. It’s a novel about a girl who’s in a relationship with the dead spirit of Kurt Cobain, so I’ll probably devour that pretty quickly. In her brilliant, hilarious, and at times shocking debut, Mona Awad simultaneously skewers the body image-obsessed culture that tells women they have no value outside their physical appearance, and delivers a tender and moving depiction of a lovably difficult young woman whose life is hijacked by her struggle to conform. 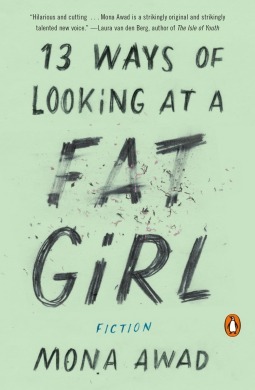 As caustically funny as it is heartbreaking,13 Ways of Looking at a Fat Girl introduces a vital new voice in fiction.